Clips on JOBMAN Workwear Construction Work Pants!!! Introducing a Swedish Knife manufactured by Lindblom's Knivar, a Swedish Knife Manufacturer. 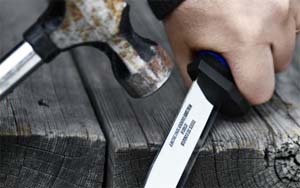 This knife, made of a robust heavy Stainless steel, is designed to withstand heavy use. This rugged blade can become your best friend on the job. Engineered to take abuse at work, it can be used to perform a variety of quick actions during your day. The firm grip 3-layer rubber handle is made to last and provides comfort and protection for your fingers. The blade is 3 1/2" long with a 1/8" thick stainless steel blade. The steel is of very high quality stainless steel which is hardened to HRC 58-60. The plastic sheath is included and designed to be clipped onto many of the JOBMAN Workwear workpants. The button on the side of the right leg of the pants is there for this type of knife. The sheath has a slot in the top and the sheath clips onto that button. This puts the knife at the right height for easy access when needed. The knife sheath has a pressure fit to the knife, so when pressed into the sheath, you will feel a click and then the knife will be secure. The knife can also be fitted onto thin belts if a knife button is not available on the pants you wear on the job. This knife is designed to be used and used hard. It can be resharpened, but is engineered to keep its initial edge a long time. It makes a great accessory to your workwear, and puts the functionality of the pants to a new level. The knife itself is great - good grip & sharp enough for me since I use it for all the wrong purposes. The sheath, however, is useless for those of us who wear jeans and wide belts. Why not market one that doesn't require special pants?